Simplify scheduling by creating weekly sessions for your clients. Once created, you’ll be taken to the first session in that series. A recurring series must start in the future. A recurring session can repeat for a maximum of 24 instances (6 months). 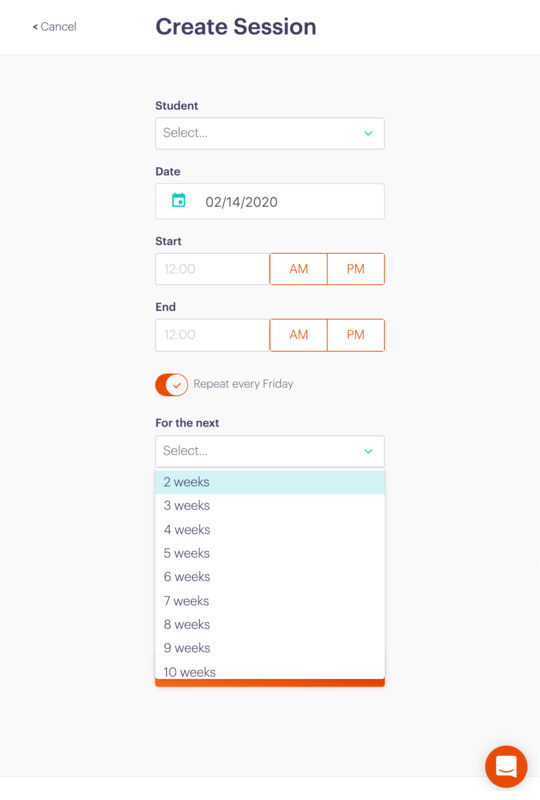 Weekly is the only option for now; if you want to do a recurring on Monday and Wednesday for example, you’ll need to create two separate series. You can still edit any session individually, but if you make changes to one session in the middle of a set, it will no longer be associated with that set. Once there, you’ll see which sessions you’re currently editing, as well as the ability to change the day of the week, the start time, end time, and location. Making and saving any changes from here will apply to all the sessions in that set. You can choose a single session in the series to delete, or delete the chosen session and all following sessions.